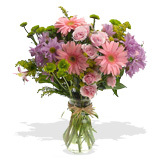 $50 - $65 Flower Bouquets FlowerFresh features every kind of fresh flower bouquet in a dazzling array of colors, flowers and price. No matter what your budget, you can be guaranteed that we have your favorite fresh flower bouquets in the color and price that suits you perfectly. Spring flower bouquets that have intensely brilliant colors and make a superb decoration in the home. If you have a specific occasion in mind, for example you would like to show feelings of gratitude and respect, you can chose our gorgeous pink rose flower bouquets.